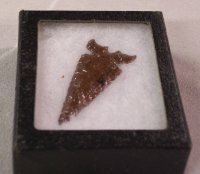 Put your custom made Arrowhead in a Riker Mount Shadow Box. These boxes are thick black cardboard with a glass front and contain white cushioning material. Now coming in the five size options listed below. Item #JPD001 -- Size 3" x 4" x 3/4"
Item #JPD002 -- Size 5" x 6" x 3/4"
Item #JPD003 -- Size 6" x 8" x 3/4"
Item #JPD004 -- Size 8" x 12" x 3/4"
Item #JPD005 -- Size 12" x 16" x 3/4"